Is it lazy to pay somebody else to potty train your child? Ah, the burning question on everybody's lips. Well, maybe not everybody's lips - some people don't have a lot of time to go around considering what is lazy and what is proactive, but sure look, it's a parenting question worth considering anyhow so we might as well. 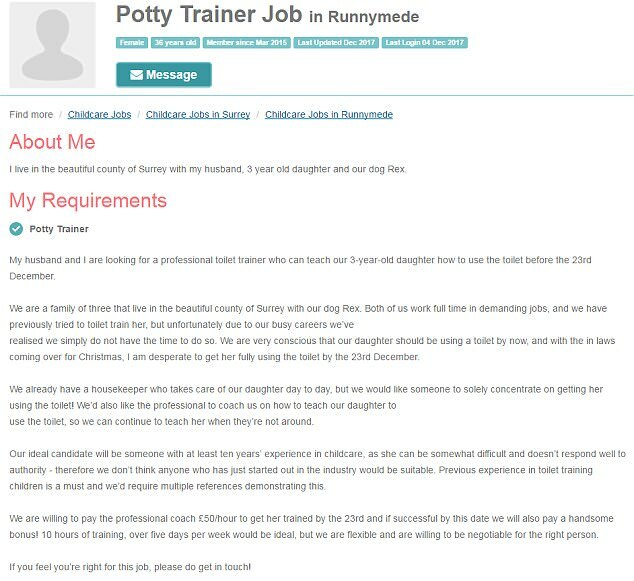 Recently, a busy mum shared an ad on a local jobs website in the UK offering £50 an hour for anybody who could potty train her child. "My husband and I are looking for a professional toilet trainer who can teach our three-year-old daughter to use the toilet before the 23rd of December," she wrote. The mum justified her advert by saying that she and her husband were very busy and that they did not have time to teach their daughter how to go to the toilet themselves. The couple said they already have a housekeeper who looks after their daughter "day-to-day" but they need somebody else to come in to focus on toilet training. They are looking for somebody with at least 10 years of childcare experience and have said they will offer a "handsome bonus" if the candidate manages to get their daughter toilet trained by the agreed date. "10 hours of training over five days a week would be ideal," she wrote.